​Settlement in the Huddersfield area began over 4000 years ago with Neolithic man. The most obvious evidence of early settlement is the hill fort at Castle Hill, at Almondbury to the south of the town. ​This conspicuous landmark, with its stone Victoria Tower – built in 1899 to mark the Queen’s jubilee – was occupied from around 2100 BC. Various defences were built here, the last being a strong Norman castle. But the Normans were only the latest of a succession of early migrants to the area. The earliest written reference to the inhabitants of this area is to the Brigantes, who were living here in the 1st century BC. They may have come from Bregenz, a region of Austria on the banks of Lake Constance. The Brigantes were subdued by the Romans, who established a fort at Slack. The Roman troops stationed there came from various parts of Europe. Huddersfield & District Archaeological Society have done a great deal of research on Huddersfield’s Roman history, especially the fort at Slack (Outlane) and the Roman road which passed through it. After the Romans had left, Angles and Saxons arrived, and the first Anglian settlement in the area may have been at Hillhouse. It is unclear how far the Anglo-Saxon invasion displaced or destroyed the Romano-Celtic population, or how far they inter-married and merged together. In the ninth century Viking incursions reached the area, though no clear indication of Viking settlement has survived. The Norman invasion from 1066 brought major changes in landownership but little further population change until the last two centuries. The de Laci family owned the manor of Huddersfield until 1322, when it became the property of the Crown. In 1599 William Ramsden bought the manor and during the ownership of the Ramsden family, continuing until 1920, Huddersfield grew to form the basis of the town we know today. Due to the poverty of the hilly land, local people found it difficult to produce sufficient food to support the growing population, and from early days the conversion of wool to cloth supplemented their incomes. This was helped by a plentiful supply of wool and fast-running streams of soft water necessary for cloth production. For centuries the industry was based in people’s homes or in small mills on upland streams. During the industrial revolution of the late 18th and 19th centuries, the industry increasingly moved to larger mills in the valley bottoms – especially the Colne Valley. Alongside the growth of textiles – which included cotton and linen as well as the dominant woollen industry – strong engineering and chemical industries developed to provide the necessary machinery and dyestuffs. At different times the Ramsden family encouraged this growth. They built a Cloth Hall (or textile market) in 1766, Sir John Ramsden’s Canal in 1780 and other facilities. With their (eventual) support the railway arrived in the 1840s, with lines west to Manchester, east to Leeds and south to Sheffield. ​Huddersfield Station, now a Grade 1 listed building, was described by John Betjeman as 'the most splendid station facade in England'. The industrial wealth of the town in the second half of the 19th century is reflected in its legacy of fine Victorian buildings. Whilst quickening economic growth, the industrial revolution caused great social and political strains. Huddersfield was at the centre of the Luddite agitation of 1811/12, when militant skilled workers broke up new textile machinery, and the campaigns of the 1830s and 1840s to limit factory hours and resist the workhouse-based New Poor Law of 1834. A leading figure of both these campaigns, based in Huddersfield, was Richard Oastler, whose name the town commemorates in several ways. 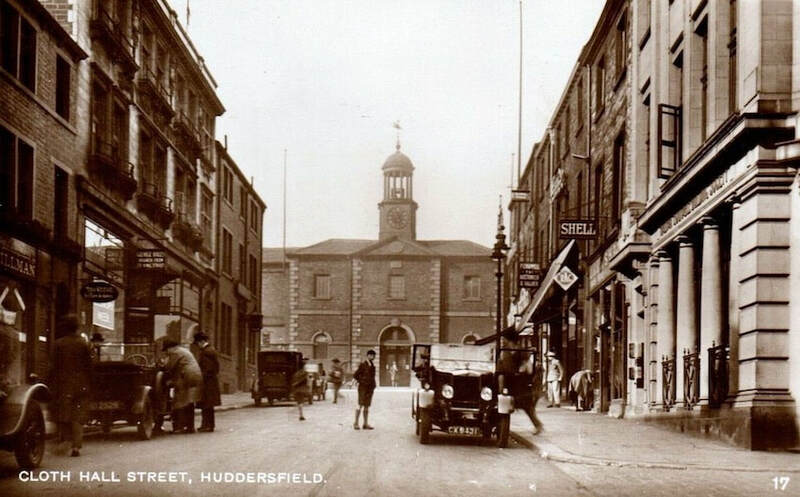 Like many northern industrial towns, Huddersfield gained a seat in Parliament for the first time in 1832. In the 19th century and on into the 20th it had a strong Liberal tradition. More recently the Labour Party has been prominent, and holds the seat at present. A son of the town, Sir Harold Wilson, Labour Prime Minister in the 1960s and 1970s, now has a statue to his memory in front of the station, and earlier Prime Ministers Asquith and Baldwin also had Huddersfield connections. The town did not become an incorporated borough, with its own elected corporation, until 1868, but this soon became a pioneer in many municipal services, including tramways, public health and electricity supply. This was also the period when many schools were founded, after the 1870 Education Act, although the oldest school in the area, King James’s Grammar School at Almondbury, goes back to 1608. Earlier in the 19th century Mechanics’ Institutes were founded to provide education for the working man, and these were the forerunners of today’s Kirklees College and Huddersfield University. In 1920 the Ramsden family sold their estate to the Corporation for £1.3m, so Huddersfield became ‘the town that bought itself’. Since 1974 it has come within the wider area administered by Kirklees Council – Kirklees being one of the five districts of West Yorkshire. A very brief history of local government institutions in the area is available here. Huddersfield people have formed many clubs and societies. The world-famous Huddersfield Choral Society was formed in 1836 and many other choirs and orchestras also maintain the town’s strong musical tradition. There are annual musical events such as the ‘Mrs Sunderland’ competition, which began in 1889, and the more recent Contemporary Music Festival. The University’s music department has a high reputation, and brass bands abound in the area. In the sporting field Huddersfield has held its head high with famour cricketers George Herbert Hirst, Wilfred Rhodes, Schofield Haigh and Percy Holmes. Runner Derek Ibbotson broke the world record for the mile in 1957 and Anita Lonsbrough won the 200-metre breast stroke event in the 1960 Olympics. Huddersfield Town Football Club were Football League champions three years running in 1924-6. Following relegation from the First Division in 1972, the club spent 45 years in the second, third and fourth tiers of English football, before returning to the top flight in 2017 under manager David Wagner. They play at the modern John Smith Stadium (formerly the Galpharm Stadium), which was recognised as 'Building of the Year' by the Royal Institute of British Architects in 1994. The stadium is also home to Rugby League side the Huddersfield Giants; the Rugby League was formed at a meeting in the George Hotel in 1895. Obviously this page has only scratched the surface, and much more information is available on the town’s history. The Society’s own booklets are listed on the Huddersfield History Society website. There is a wealth of information on local history at the Local Studies Library and West Yorkshire Archive Service, both based at Huddersfield central library. Huddersfield: A History and Celebration, by Lesley Kipling and Alan Brooke (Francis Frith, 2005) is a recent brief general history with many photographs. The last full narrative history was Roy Brook’s The Story of Huddersfield (Macgibbon & Kee, 1968). Before that were the histories by Taylor Dyson (1932) and D.F.E. Sykes (1898). Even earlier, Charles Hobkirk’s 1868 history is available in full online, as is Joseph Hughes’ History of Meltham. In 1992 Kirklees Council published Huddersfield: A Most Handsome Town, a set of 26 wide-ranging scholarly essays on many aspects of the town’s history, edited by University Archivist and Local History Society secretary E.A. Hilary Haigh. The well-known surname expert George Redmonds has also published a great deal on his local town, including The Making of Huddersfield (Wharncliffe, 2003) and more recently The Place-Names of Huddersfield (David Shore, 2008). We are indebted to Huddersfield Local History Society for permitting us to use the material on this page and we commend its excellent website.